The brand's integral role in the superhero movie leaves marketers salivating and some fans feeling queasy. 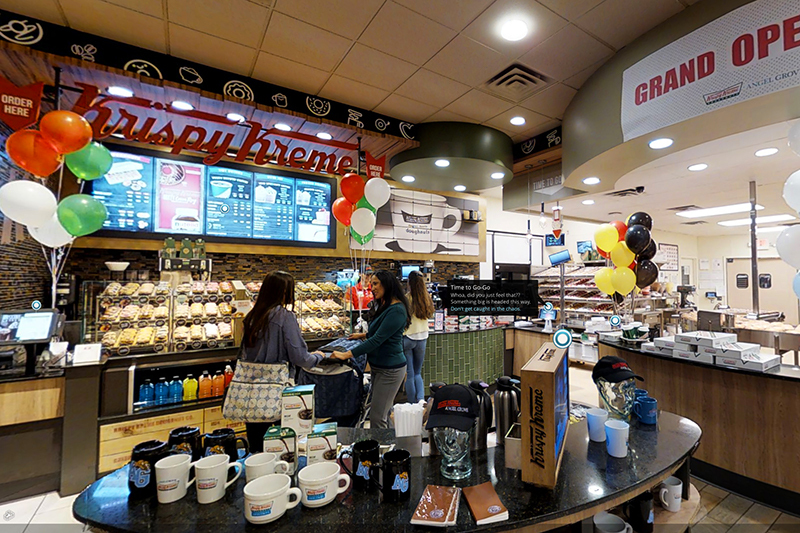 Krispy Kreme Doughnuts is traditionally known for its product—specifically, the Original Glazed doughnut. But on Friday, thanks to the new Power Rangers movie, the brand became recognized for its product placement. In the film, the characters don’t just walk by a Krispy Kreme sign like Renee Zellweger did in "Bridget Jones’s Baby," and they don’t simply eat a Krispy Kreme doughnut. They do both of these and more as Krispy Kreme is pivotal to the plot. Here’s what happens: Alien villain Rita Repulsa, played by Elizabeth Banks, comes to Earth to steal the Zeo Crystal, which gives the Power Rangers their, well, power. And guess where it’s buried? Underneath the town’s newest Krispy Kreme. Thus, an alien eats a doughnut, a fight breaks out and Krispy Kreme’s brand awareness skyrockets—all in that order. "This is honestly one of the tightest branded content integrations I’ve ever seen in a movie. It’s not just James Bond in a car chase," said David Baldwin, founder Baldwin&, Krispy Kreme’s AOR. "This is integral to the story in a non-obtrusive way," so movie-goers don’t think, "Oh wait, a commercial just broke out." On Twitter, some fans agreed with Baldwin. The new Power Rangers movie is a two hour long @krispykreme commercial and it's so good. I have a lot of strong, yet mixed feelings about Krispy Kreme's Saban's Power Rangers. Gonna stew on it while I drive home. But many Power Rangers fans thought Baldwin&’s virtual reality experience to promote the film, which they discovered through Krispy Kreme’s and the movie’s social media, was on-point. In it, the North Carolina-based agency stages two scenes: a jubilant grand opening of a Krispy Kreme in Angel Grove, the movie’s fictional city, and the aftermath following Rita Repulsa’s clash with the Power Rangers. Created in conjunction with real estate marketing firm VR Listing and Matterport camera technology, the experience includes Easter eggs like the Power Rangers’ names etched into a wooden table, an exclusive movie clip and links to Krispy Kreme’s and Angel Grove High School’s websites. Virtual reality is "always blurring those lines around reality and fiction," Baldwin said. "We’re bringing you into the Angel Grove world." Other promotional efforts include an official hashtag #KrispyKremeAngelGrove, a Snapchat geofilter and a sweepstakes for the chance to win a trip to San Francisco. And, for a limited time, Krispy Kreme is bringing the Power Rangers into real life by releasing five chocolate iced, cream-filled doughnuts with sugar-candy lightning bolts that correspond to the colors of each character’s superhero suit. Maybe movie-goers will be enticed to grab one after the final credits roll. Krispy Kreme, which was acquired in 2016 by German conglomerate JAB Holding Company, spent $1.2 million in advertising last year according to Kantar Media.